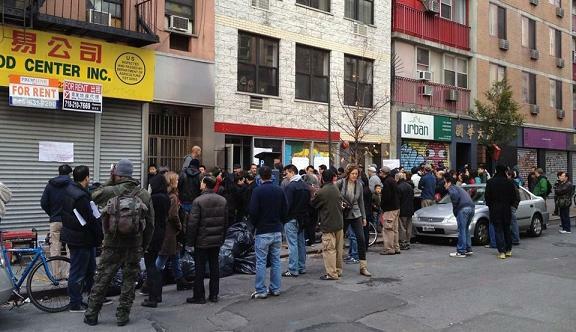 Image from CAAAV office hours after Hurricane Sandy. Research and experiences shows that people run towards, not away from, disaster. The very first responders to an event-based crisis are always disaster survivors, followed by locals. Then, at some point, the official response, NGOs, and other disaster experts arrive. These later groups are also the first to leave while community and activist groups remain for long term recovery. The North Star Fund has released, “From the Edge of Disaster: How Activists and Insiders Can Use the Lessons of Hurricane Sandy to Make the City Safer,” a research and recommendation report drawing on 30 interviews with community-based organizations (CBOs) and participation in dozens of meetings and conferences across the city over the past two years. It is a preliminary report; a longer and more detailed version is forthcoming. so vulnerable in the first place.” Many of the report’s recommendations for rebuilding are based on the idea that resiliency, or the ability to bounce back after extreme weather crises, are skills developed at the local social level, the domain of CBOs. Yet, the support of government and philanthropy is essential due to the balance of resources in these institutions. Thus, recommendations are about proposing and strengthening partnerships between community groups, government, and philanthropy with the goal of enabling CBOs to take a lead in local expertise. The report calls for a tangible, common map that lists the “relevant assets and capacities in an emergency.” Versions of such maps listed include New York Disaster Interfaith Services map of faith communities, the Red Cross mapping project, and the Pratt Institute maps that show levels of social vulnerability in impacted areas. SRL also found that the NYC Department of Sanitation had excellent maps and local knowledge at the capillary level of streets, alleys, and households. Consistently, research finds that centralized locations where information and gathering can take place are not only essential to disaster relief, but occur as a matter of course. These tend to be churches, libraries, or community organizations that are already known and trusted as public space before crisis. From the Edge of Disaster argues that these should be designated ahead of time. During Sandy, power, cell phone service, and even landlines went down. Yet, Twitter, FB, phone hubs, and other networked technologies central to relief. Address the gap between local organizations and their expert local knowledge and elite institutions with their greater resources but less knowledge of what communities want and need. The report flags the strain of finding, dispatching and managing volunteers as a major challenge for the CBOs: “While some communities were flooded with help, others did not have enough.” Various systems were used to deal with the problem from the sloppy but immediate use of Twitter to the database-driven CiviCRM system used by Occupy Sandy to coordinate tens of thousands of individual volunteers, the largest effort in the City. Many groups and residents are frustrated by the readily apparent under-use of disaster management plans developed before disaster. While there are reasons for this under-use (see “The Fantasy of Disaster Response Documents“), the report calls on government to determine if such plans are relevant or feasible. This recommendation reinforces the notion that the real disaster is long term economic inequity and injustice. The report asks for a single point person and office that organizes all government resilience efforts–both infrastructural and social. Here, the emphasis is on climate-related planning during calm and developing CBOs capacity and resources during disaster events. This reccomendation is mainly for philanthropists, many of whim requested that CBOs act as go-betweens for micro-loans and grants. The report requests that they same thing occur, but without CBOs as in intermediary, which often caused strain for such groups already overwhelmed with providing other forms of aid. The report calls for concrete plans for physical and social structures that both mitigate and adaptat to climate change. Pipa, Tony. “Weathering the Storm, The Role of Local Non-Profits in the Hurricane Katrina Relief Effort,” Aspen Institute. Solnit, Rebecca. A paradise built in hell: The extraordinary communities that arise in disaster. Penguin, 2010.